Larry Dean and Allyson June Smith to make regional debuts for long-running comedy institution. We hope you've already clocked the punchline – because The Laughter Factory's October tour is one of dazzling diversity, mixing of-the-moment upstarts with veteran talent, and British reserve with North American reveal. Fresh from the Edinburgh Fringe is the fiercely original Larry Dean. This utterly unexpected talent burst onto the scene when he was named Scottish Comedian Of The Year in 2013, before hitting it huge with last year's solo show Out Now!, which enjoyed an acclaimed sell-out Edinburgh run. Dean makes his Dubai debut fresh from premiering hyped follow-up Farcissist. Also making a first Laugher Factory appearance is the outrageously outspoken Canadian comic Allyson June Smith, who arrives fresh from warming up Jason Manford's UK tour, who quipped “I think I need a different less-good support!” after having to follow her onstage. Happy to delve into the most intimate details of her personal life, Smith's brash delivery has made her a celebrity at home, nominated numerous times for Best Female Stand-up at the Canadian Comedy Awards. The bill is rounded out by upcoming English stand-up Nick Dixon, an overnight sensation who has earned a reputation for showing wit and spark while exposing an unhealthy vulnerability and self-deprecation. After smashing it on his last tour, Nick returns to The Laughter Factory fresh from recently taping his second appearance for TV network Comedy Central. A sharp-talking Scot who defies all expectations, Larry Dean is one of the most original voices to emerge from the UK comedy scene in years. Praised by The Guardian for his “cheeky-chappie shtick”, and described by the London Evening Standard as “fascinatingly funny”, this garrulous Glaswegian is already well on the way to becoming a household name. It has been an incredible ascent. Dean was 23 years old when he was named Scottish Comedian Of The Year, in 2013. Larry's star went supernova with last year's solo show Out Now!, which captivated audiences and critics alike with a sell-out Edinburgh Fringe debut, and earned nominations for the Fosters Comedy Awards' Best Newcomer and the Scottish Comedy Awards' Best Festival Show. Next, Dean took that eye-opening hour of stand-up on tour throughout the UK, and made a much talked-about debut at the' Melbourne International Comedy Festival's Allstars Supershow Opening Night Gala. In a snowball of happy hype, Larry was invited on the road supporting A-listers Stephen K Amos and Eddie Izzard, and has made a mark on the airwaves with numerous TV appearances, including BBC Presents: Best Of The Edinburgh Festival and Live From The BBC. Appearing on a Laughter Factory bill for the first time, this serious talent should be on any comedy fan's bucket list. Hilariously observational and not afraid to over-share, Allyson June Smith is a funny firecracker of confessional wit, bite and shame. Hailing from Canada, Allyson brings a certain North American bluntness to her deeply personal brand of stand up – expect to hear about lost dates and lost days, the birds, the bees, the blues, and all manner of modern life issues facing this decidedly bold female stand-up comic. Ditching a career as a classroom teacher, Smith has been on the scene since 2000, earning notable celebrity in her home country with multiple nominations for Best Female Stand-up at the Canadian Comedy Awards. Another fan is recent Laughter Factory celebrity headliner Jason Manford, who conceded: “She has set the bar high! Think I need a different less-good support!”. Ouch. 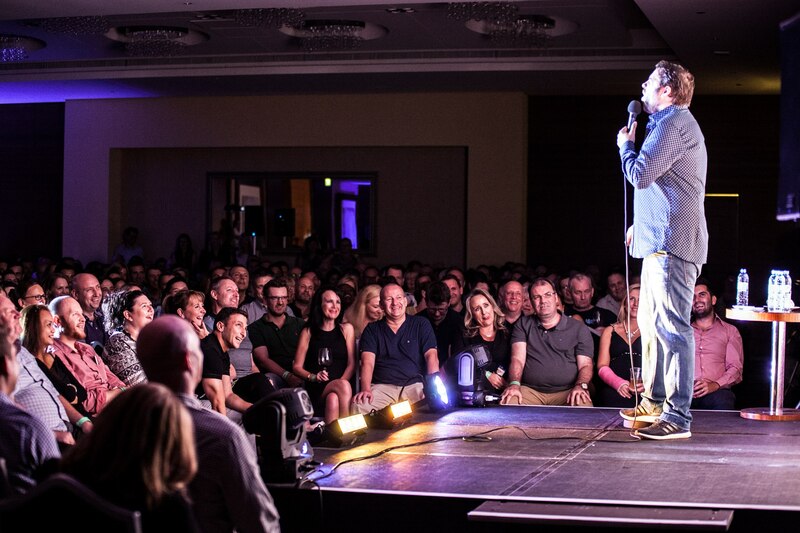 Witty British funnyman Nick Dixon arrived out of nowhere to a unanimous critical welcome. After just three months of stand-up experience, in 2011 Dixon reached the final stages of The Leicester Square New Comedian of the Year. Next he beat off competition from 800 entrants to bag a slot on BBC Radio’s prized New Comedy Awards. Within a year he was a finalist in the career-making 2012 Edinburgh Fringe new comic contest, So You Think You're Funny? A bright new talent had officially arrived. Renowned for an intelligent mix of wit, vulnerability and insight, Dixon tunnels the subtle art of self-deprecation into fresh and hilarious depths. Nick recently taped his second live TV slot for Comedy Central at The Comedy Store, cementing the rise of an unstoppable ascent. The Laughter Factory's commitment to comedy has been recognised by numerous publications, winning several accolades over its two-decade history, including a Lifetime Achievement Award from Time Out Dubai in 2013.